Yet another News Corporation executive is talking about Google, and yet again, I feel like they have no concept about how Google interacts with their web pages. Which is frightening, since they’re being very vocal about how they’re supposedly wronged by Google. Please, someone, give them a search marketing 101 course. In the latest volley, News Corp’s president and COO Chase Carey tells Business Insider that being in Google is a “backdoor” that doesn’t “make sense” to offer if they’re trying to sell paid subscription. Yes, you can use Google News as a way to get around the Wall Street Journal’s paywall. Through the First Click Free program that Google offers, anyone coming from Google has to be admitted to see the actual article. In fact, I’m a guilty party in telling people how to do this (see my Read The Wall Street Journal For Free post). FIRST CLICK FREE IS NOT REQUIRED. YOU DON’T HAVE TO DO IT, AND YET YOU CAN STILL BE IN GOOGLE. Sorry about all those caps and bolding, but after reading so much commentary earlier this week about News Corp’s Rupert Murdoch potentially taking his news content out of Google, I was amazed that this key point was being missed. Publishers can have Google News index the entire text of their articles but NOT show the full story to visitors who come from Google (for Google’s web search, that’s not an option — but you can provide summary pages). They can also, if they choose, have only a small summary of their content indexed. These aren’t special hidden features that News Corp wouldn’t know about. Both are explained in Google’s public help files. No luck. I have to subscribe. No First Click Free, no passing Go, you collect your $200. By the way, to my understanding, News Corp’s Barron’s has done this in the past and may still do this, so News Corp really should be aware of the option. 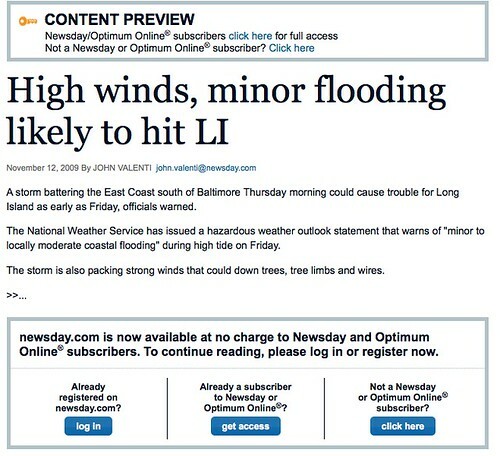 Also, Google is supposed to flag this type of content with a “subscription” label, but that’s not being done for Newsday, probably due to a glitch. I’m checking on that. The prevailing wisdom seems to be if you build it and they come, why not let them in the door ? The answer is because they get there, but don’t really know or care where they are at. They went to google and got what they were looking for from some site google sent them to. I know the numbers i have seen from news sites show that retention of uniques earned through google searches is not high. They are visitors. They leave. There is no relationship developed. IMHO, just as people ignore the banner ads on pages, they ignore the name of the company presenting the content. One is just above the other. You are the search expert, but my business sense tells me that its better to focus on the people who are there to dance with me. Block google. See what the information tells me. See what happens. I dont think you lose anything, and you might just hit a home run. By the way, Carey didn’t just say that Google News readers should be cut-off from seeing free articles. He said he didn’t want people using any “channels” from getting there. So I guess that means the much discussed deal with Digg back in 2007 is on the chopping block, too. You know, the one that got a big splash because if someone submitted a story to Digg from the WSJ, then anyone could click from Digg and read that story? Also, if the Journal really wants to be consistent, then you need to stop with the giveaway of ANYTHING on the site. As my Read The WSJ Free post also explains, the WSJ site itself has free content that it puts out for anyone independently of Google News. In fact, at Nieman Journalism Lab, WSJ executive editor Alan Murray explicitly described how the WSJ drops the paywall independently of Google, Digg or whatever — how you can start right at the WSJ site itself and get plenty of free stuff. Rupert Murdoch added the Wall Street Journal and other Dow Jones properties to News Corp over two years ago. I understand that it takes time to fully digest what he purchased. I understand he and his executives might not realize all the various ways that they themselves might be inconsistently fueling the same news “promiscuity” that they’re pinning on Google (see Dear WSJ: To Avoid Google Disease, Please Put A Condom On Your Content). I understand Murdoch and his executives may not still realize yet how News Corp does some of the same evil aggregation that it rants against (see A Look At All The Sites Owned By Rupert Murdoch That ‘Steal’ Content from TechDirt for more). But still, it doesn’t make much sense. I don’t understand why he is attacking Google so hard when he has so much control over his own content. He can keep them entirely out. He can let them send visitors but not give anything away at all. So could any newspaper, right now, today. But his executives have positioned Google as a “vampire” that’s somehow caused all this disruption. If you’re seen as a threat to quality journalism, as someone who oversees another part of your empire (Fox News) that the White House is trying to dismiss as a news organization, what better way to be seen as a journalism champion than to speak out as if you’re protecting all journalism from the evil of Google? Build Google up as the real threat to journalism. Suddenly, other media execs who viewed you as the “bad boy” of the journalism world are now looking at you with newfound respect (despite the fact that most of them are not “must carry” and won’t get any potential deal you might land). Now THAT makes sense. Alternatively, it just makes sense that the News Corp execs simply don’t get how their businesses operate online, in respect to Google. Neither prospect is encouraging. As you’ll see in the comments below, I’m sure they and others can survive without it. But I suspect they could thrive with it. What’s amazing is that as shown above, News Corp spends money on ads at Google to attract the same audience from Google that they say isn’t as valuable. So we’re either getting PR spin or they’re doing a poor job of trying to convert those Google visitors. With the ads, they can tell someone is after business news in general and send them to a very targeted landing page. With an click to a news story, someone’s intent IS different. They aren’t explicitly looking for site about business news, for example. But they clearly are interested in business news (or some type of news, as they’ve come). If they’re not converting, part of the issue is probably that the Wall Street Journal has done a poor job of trying to convert them. Rather than show them the same layout as you’d get when coming into the site, potentially they could have a much more simple display — with much more of a tailored pitch for getting more news.